How fabulous is this hand-painted Mickey Mouse napkin ring? Here he is in his early Disney rendering- all rat-like but with his trademark big ears. Mickey first appeared in 1928 [in Steamboat Willie] and this napkin ring was made not soon after. I found Mickey in a collector’s sale lot of napkin rings and bought the lot because Mickey was there. Mickey is in great condition with only a little wear to the hand-painting on his extremities- ears and nose. He is very collectible- as is any vintage Mickey Mouse item. 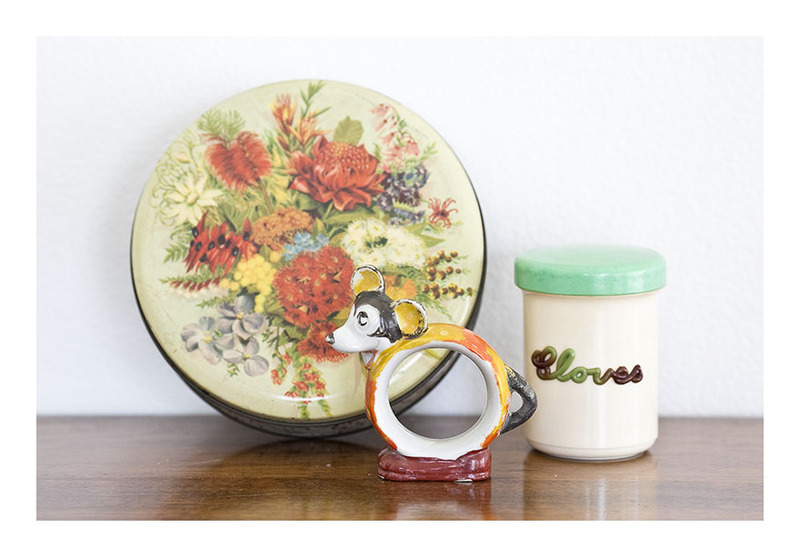 Mickey’s from the 30s and 40s are now highly sought after. Bonzo the dog was the first cartoon character created in England, by George Studdy in 1922. Bonzo has been reproduced in a myriad ways since those early comic books- from figurines to kitchenalia and of course, in tin. You might be familiar with the very popular salt and pepper shakers, which have “I’m Salt” and “I’m Pepper’ emblazoned on two upright Bonzos. Bonzo paraphernalia has been in and out of fashion since the 20s – and I’m pleased to say he is coming back in again. I have researched this Bonzo tin – it is unmarked- but have been unsuccessful in ascertaining the maker. I do know from other collectors that this is a Bonzo trinket tin [rather than, say, a sweets tin] made in the 30s. It has a little wear to the hand-painted finish and some rust but is still air-tight for the keeping of trinkets. I also have a Bonzo napkin ring [see post below.] So now I have two Bonzo pieces a fledgling Bonzo collection has started. Not that I need another collection – it’s just those kitschy large eyes on the very 20s-looking dog that gets me in. 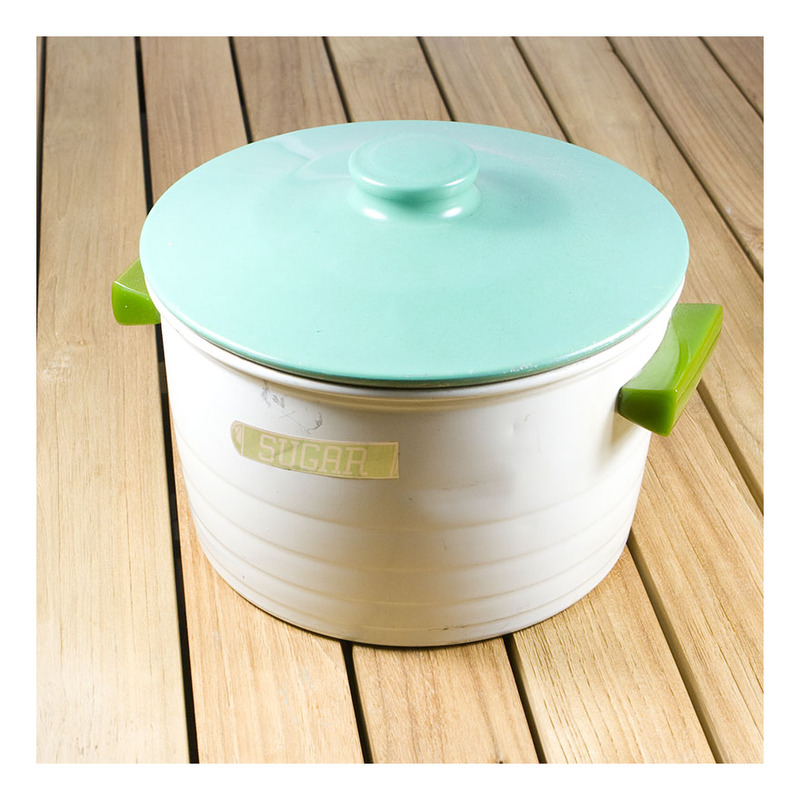 A wonderful example of a depression era canister – this aluminium sugar canister evidences all the hallmarks of the 30s- drilled, green bakelite handles, mismatched green tones, applied ‘Sugar’ label, and graduated rings to the cream base. Anodised aluminium was in its infancy- and achieving colour matching next to impossible. So each green lid was slightly different across the whole set of five canisters [and added to this of course, is colour fading over time.] Meanwhile bakelite technology was forty years old- you could get any colour you wanted there. Xylonite was first produced in 1875 – to imitate ivory. It was the first thermoplastic made – as an ivory substitute it was first used for knife handles and jewellery, then all manner of domestic products. Xylonite has tiny parallel striations of yellow and bone- which gives it a faux ivory look- although, interestingly- this was an accident. The manufacturers were attempting to create a timber-look-alike, so named the new celluloid product xylonite – ‘xylon’ being Greek for wood. Whatever, the production of xylonite saved much real ivory being used. I first became interested in xylonite when I was researching bakelite [after first becoming interested in resin.] So I now have an abiding interest/affection for all types of vintage plastics. This set of xylonite illustrates how- over time [and exposure to direct sunlight] the normally off-white plastic colour starts to yellow. And this is in excellent condition!- it is of course a hundred years old. The set comprises four lidded ladies boudoir containers, a boudoir tray, hair brush and pen knife and a gentleman’s stud container sans lid. Here we have a blue and white striped jug and pudding bowl from the 30s; the blue and white colours were used to resemble English Cornish Ware and were the premium pieces produced in the 20s and 30s. Every day pieces- were termed ‘Cream Ware’ while the blue and white pieces have the MADE BY BAKEWELLS, SYDNEY N.S.W. backstamp. Being handmade in the 30s, the colour of the glaze and the clay used varied, so each piece is slightly different. Three different sized jugs were made, and six different sized bowls; with the largest bowl having a pouring lip. This meant that pudding bowls could also be used as mixing bowls, and vice versa. Koala shaving mug, made in Australia, c.1930-1940s. Shaving mugs are highly collectible and becomingly increasingly hard to find. The ceramic ‘woodgrain’ finish shaving mugs [woodgrain- presumably to render the pottery more ‘manly’?] by KSP predate the pastel colours of the 50s, and yet anticipate those very colours. Yes, now I am certain the woodgrain would help with the whole manly act of shaving. The pink, yellow, & green shaving mugs are all in perfect condition, and marked ‘KSP, made in England’ on the underside. By contrast, the blue shaving mug is made in Australia by Koala. Koala pottery had a short run, and produced- as far as I can tell- only shaving mugs. I would love if the shaving mug had a koala’s face on it, but alas, it’s a purely perfunctory item, other than that cool blue colour. It’s also in tip-top condition. 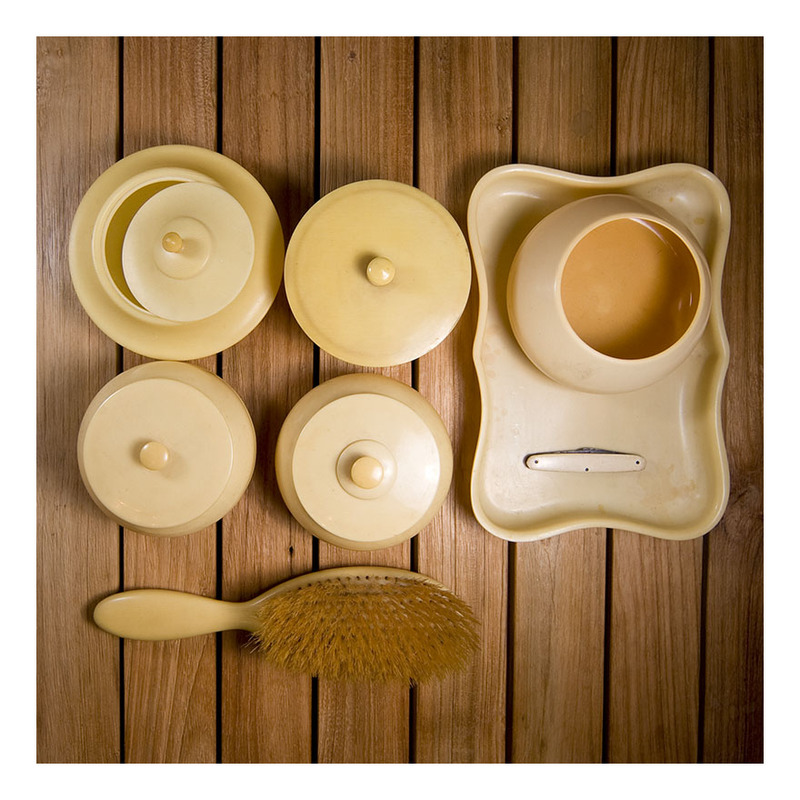 I love a bit of vintage kitchenalia – and when you have three or more items of the same type/vintage they look great massed together in the contemporary kitchen. Add to that that these jugs are still good for their intended purpose – and equally good holding fruit or kitchen utensils or a bunch of flowers–and what’s not to love! Glass measuring jugs were made during the Depression- glass being cheaper to manufacture than tin or steel. 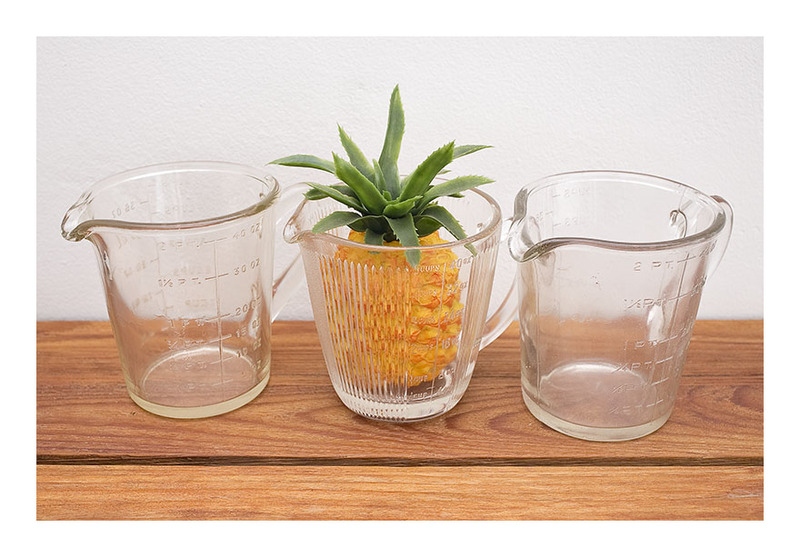 These jugs all measure 5 cups / 2 pints, with the graduated measurements cast in relief during the manufacturing process. There were often bubbles in the glass, and the visible seams in the jugs mark them out as being Depression glass. When buying vintage glass it’s important to check that the pouring lip and rim are entire- with no chips or scratches – especially if you intend using the piece in the kitchen. Have I mentioned that kookaburras are very collectible right now? 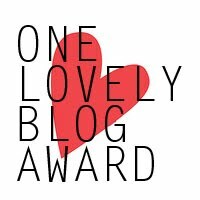 Perhaps once or twice! This delightful set of teapot, creamer and cake plate was made in 1933- as evidenced by the design of the Noritake backstamp. 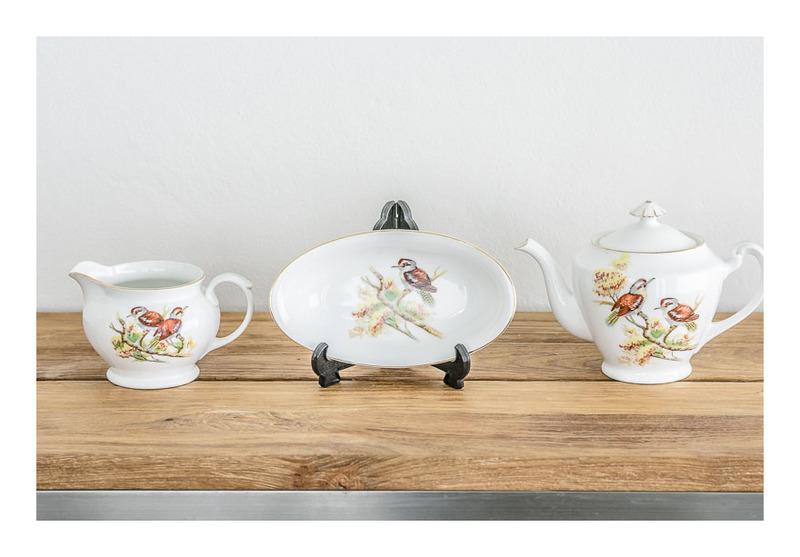 The backstamp also indicates the pieces were “exclusively made for the Commonwealth of Australia market” – this fascinating information found on the Noritake website. It seems kookaburras were highly sought after in the 1930s too. On this set, the kookaburras are paired on one side of the piece, and single on the other. They are all handpainted, and quite delightful. All pieces are in pristine condition. This fabulous ceramic kitchen canister is called ‘Beulah Ware’- named for Bakewell’s wife, Beulah. The fantastic ‘tea’ font and decoration is all art deco. The earthernware canisters came in a set of five: Flour, Sugar, Rice, Tea and the smallest, Sago. A full set of canisters is next to impossible for find now – and originally, they came in this pastel green, a pastel yellow and a baby blue. You may remember that I found the ‘Flour’ canister, sans lid- and now use it as a vase [see post, below.] And that just recently I posted a set of matching graduated jugs- same hand-coloured green glaze and with the same art deco styling. Bakewells started production in 1884 and like so many potteries, moved away from making industrial ceramic products -like bricks and pipes- to domestic wares in the early part of the twentieth century. By the early 30s Bakewells was making pudding bowls and graduated jugs in multi colours- all to meet the insatiable demand of the new middle class. Bakewells is now very well known and very collectible. This is an image from my own kitchen [and kitchenalia collection]- but I draw your attention to the Bakewells graduated jugs in green on the top shelf. 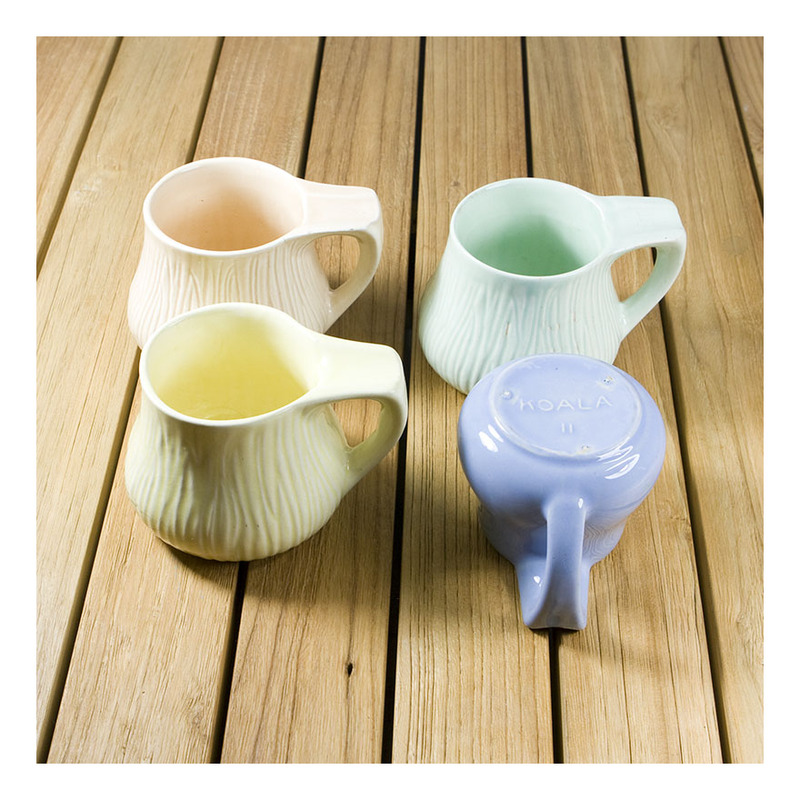 I have just recently added to this collection – and find I have no more room to display it: so for sale are three green graduated jugs: similar to the first three of the four jug set seen here. You only need find the fourth- smallest- to create a set.